I asked Robert if he could remember where I did my first runs...for some reason I was drawing a blank. My first runs were around St. Andrew's circle by the Country Club. I ran while the kids had their tennis clinics. It couldn't have been more than 2 miles (if that) and I had to walk most of the uphill portions. It's amazing how quickly running can improve in four short months. I picked up a book about running today. There wasn't much new info, but there was one big nugget that stuck out. It talked about the fact that you can think of achieving cardio improvements about every 3-4 weeks, muscular improvements every 9-12 weeks, but tendons and ligaments can take a full 9-12 months to ratchet up. The authors contend that it's not at all surprising that folks like me end up with injuries a few months into a program. At that point we've made great strides in terms of cardio and muscle fitness, but the rest of our body can't keep up yet. This highlights the fact that I need to be smart in my choices in the next half year. I need to focus on setting a solid and healthy foundation for many years of running rather than jeopardizing that for short-term goals. Food for thought. The book also proposes that it takes four weeks to establish a habit. Anyone can white-knuckle it through three weeks, but get through four and you have the makings of a new habit. I'm fresh off my run and it felt great! The running was fine...it's the stopping that hurts. I parked by the Farmer's Market, ran to the Huckleberry, ran the trail and back. Afterward I bought some berries, homemade peanut butter, and some tarts we are enjoying for breakfast. I have no doubts I can do that half marathon in two weeks and finish strong. I think if I weren't running and saw someone running I'd want to be running so I'm glad I am running. I "smile through the miles" - I read that somewhere and it reminds me at each mile marker to be happy. If I'm getting tired and hit on a good song with the right rhythm to pump me up, I might listen to it 10 times in a row. I think how rarely I get to do just one thing and focus on it for a period of time. Running is one of the few times, and I appreciate the time and solitude. I think about how insane a marathon seems. My run today would not have even been half of one. But on the other hand, the runs only continue to get easier, so maybe?? I look forward to the challenge of each approaching hill and the fun descent on the other side. I have a drink stashed at mile 4 (and 8 on the way back) and I have a PowerGel at the half-way point so I think about those quick little breaks! Michele commented that my food amounts are low...in fact, I think they may be too low. Every 4 days or so I am absolutely famished. I think the metabolism is kicking up and I need more calories or fat or something. Last night I had pizza and that absolutely helped!! I'm not going to focus on losing anymore weight but just maintaining and if a little more trickles off that's OK too! I'm holding steady at 130. Running in a light rain can be pretty fun when it's warm enough out, especially knowing it's something most people wouldn't do. I don't like rain in my eyes. My shoes aren't shiny and new looking anymore...bummer. My hamstrings are very sore and I hope they are better by Saturday. I can get to the gym, run for 33 minutes, stretch, shower, get an iced coffee, and get back to class all in the span of a 90 minute break! Woo hoo! With the half quickly approaching, it's hard not to start thinking about the next goal. So I did mention my crazy Richmond Marathon idea to Jake today and he first asked if I had any idea how long a marathon really was. But he's thinking about it and does not think it's completely crazy or out of the question. I did promise to wait and see how the half goes before making any kind of decision and I wouldn't even consider it unless he was on board and thought it was safe and that I had time to adequately prepare. There is a half-marathon option there too and you can switch from one race to the other even the day before the race. It's fun to think about. I realize I have no idea the magnitude of this thing, but sometimes it's best not to know. 17 days until the 1/2M!!! I almost titled this post "Food" but I noticed the trainer talks in terms of "nutrition" and less so "diet". It's an emphasis on the positive - providing the right mix of fuel. Diet has such connotations of deprivation. Anyhow, I ran into a friend at the gym whom I was telling about SparkPeople and he was asking what I ate. 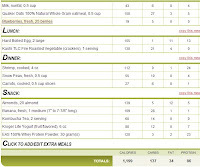 I thought I'd post three of my better days of food logs to share the types of things I eat and I am likewise interested in the favorite types of foods and meals of others. I can get in a rut eating very similar kinds of things. The two keys for me seem to be pre-planning my food for the day to drastically reduce the likelihood of bad impulsive choices, and to keep my meals really simple with a mix of food groups. I made my weight goal with some room to spare - 128.2! Then I let loose at the neighborhood cookout tonight (yum - an actual burger WITH a bun AND cheese) and it's back on the straight and narrow tomorrow. I want to keep eating clean, feeling good, and maintaining/building on what has been accomplished to this point. The workouts and nutrition go hand-in-hand and I'm wasting my time if I don't keep both ends up. One of my neighbors has been strongly urging me to consider trying the Sun Trust marathon in Richmond on November 15. It'll be his first marathon too. He runs with another fellow I know so I said I'd consider it but I wanted to see their training plan. He said they talk and joke and such while they're running and it passes the time. That's good because I can't see doing more than 12 or 14 miles alone, I'd go nuts. I'll see how the half-M goes first and then run it by JRP to see what makes sense. I'm thinking it might be too soon. There's also a half-M in Roanoke on November 22, or a half-M option for the Richmond race too. I had a solid 10 miler on the Huckleberry Trail. I didn't leave until 8:15 am and it was like running on the autobahn -- quite busy with dogs, strollers, bikes, runners, and walkers. I finished in 1:33, but more importantly I enjoyed it and felt strong! I am happy to see progress in my running and am looking forward to the halfM. Things seem to be back in better balance again in terms of nutrition, activity levels, energy, motivation, and attitude. I'm grateful for the nudge and vigillance of JRP. I've been hovering just at or just over my 130# goal for 8/24 (literally 130.0 and 130.2 on Wed and Friday), but not yet below. It'll come. More importantly, my food logs this week have gotten the rare seal of approval so I know I am on the right track and it's really about the longer term changes. I'm eating SO much differently than four months ago and I feel dramatically better. And maybe it is a control thing, but this lifestyle makeover has reduced the oppressive feeling I had that the tail was wagging the dog and it was just all wrong. Last spring was so stressful and out of control and put me in a place I did not like being. Running, playing tennis, and lifting let me step out of my life and get the perspective I need to make better choices. I intend to continue reclaiming time in my life, time I need for me and for my family. I am determined to gradually "unbusy" my life and stop sweating the small stuff. And on to other topics...tomorrow I will do the whole Huckleberry Trail. It's 11.5 miles, but I only need to do 9 - 10, so I will just walk the first and last .75 miles or so. Then next week I get to run the whole thing. I hid a Gatorade along the way...hope I can remember where I put it. I was very tempted to do the run today as it is beautiful, but I am trying not to deviate from the plan since it seems to land me in trouble!! My runs have been feeling stronger and more joyful and my confidence is returning. The IT bands are an omnipresent issue, but that continues to resolve. It was interesting that the massage therapist could sense a change on Thursday. My knee isn't a source of acute pain any longer, but I'm experiencing tightness half-way up my thigh now and on both sides. Somehow, she was able to describe my experience precisely without me saying a word! Lots left to do to get ready for fall, but ready or not, here it comes! I need to focus and use the available time this weekend and just knock it out now that Scholar (new course management system) and I have made our peace. I'm excited for classes to start next week. This morning I woke up with quite a case of bedhead but I didn't give it a second thought because I was heading out to run on campus, it was still pretty dark, and I figured I wouldn't see anyone. However, I ran into the entire corp of cadets out on some big hoo-ha run around campus with cadre folks stationed at many of the intersection. They made a lot of noise and it was pretty motivating! I think the early morning runs are tougher on my legs since they get less of a warm-up. So I came home and put my knees on ice. I had just gotten two of those gel ice packs and I put them on my knees with stretchy wraps while I ate breakfast. I have to admit they felt extra cold compared to my typical bag of ice cubes and it was rather painful as the area finally numbed. I figured that meant they were working extra well! Darned if those things didn't freeze the crap out of my skin!! When I finally took them off, my skin was all white, dry, wrinkly, and paper-y. So I re-warmed my legs in the tub and they still look raised, red, and deformed. Lesson learned. Gosh, I've had to say that a lot this summer. I always think I know better, but it's scary how often I don't!!! I was a slacker in terms of eating last week but have pledged to keep it all clean and tight this week and beyond. I am dangerously close to not making my 8/25 goal. I was 132.8 yesterday and need to get to 130. JRP set new parameters for carbs, fat, and protein, so I am mapping out my food the night before and sticking to the plan. That helped tremendously yesterday. If I focus on my eating plan and working the numbers, I focus less on the actual eating, if that makes sense. I'm also going to drink more plain water. I was doing some no-calorie drink mix stuff but I really think the artificial sweeteners can increase my appetite and cause me to crave more sweet stuff. I feel that I am back on track now, so even if I don't make 8/25 it'll be right around the corner. As I transition to fall and the new schedule, I'll have to be even more vigilant to preserve new patterns of eating and fitness. Finally I am no longer quite so ravenous. I didn't even log my food the last few days. 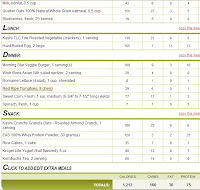 It's not that I went nuts-o, but I was surely not in the 1200 calorie range I've maintained much of the summer. Tomorrow I will log anew. Hopefully I will still make my 130 goal weight by 8/25. I was 1.8 lbs over on Wednesday. My food choices have changed over the summer and I hope they continue to improve. I've developed a taste for non-instant oatmeal with milk, a pack of splenda and a few strawberries or other berries. Another good meal was two scrambled eggs with onion and a package of frozen chopped spinach. I'm enjoying whole wheat pasta too. This summer I've learned to appreciate all sorts of fruits that I hadn't been eating regularly - plums, nectarines, cherries, oranges and the usual cantaloupe, bananas, and apples. I have to credit JRP with some of this...his suggestions remind me to make choices that minimize the processing of my food. Tomorrow I have a 7.6 miler planned. One nice thing about only running three times a week is that I definitely look forward to each run. No danger of burning out! I took the maiden voyage on the VT cross-country course yesterday. It was so fun! It wraps around corn fields and the vet school duck pond with little loops and spurs off here and there. The corn was so high and I had no idea where I was going so you got a little of the "corn maze" feeling in there. I saw a lot of folks with dogs and will take Trixie the next time I go. Most dogs were off-leash, and she's pretty good 95% of the time, but the other 5% that hunting instinct takes over and she can be gone like a shot. I do like mixing up my running surfaces and environments. It keeps it interesting. The next place I'd like to try is Pandapas Pond and the trails there. The trail running brings me back to my eventing and cross-country days...on horseback. Flying through the woods, jumping logs and banks. As a kid, particularly, it was such a feeling of freedom. Here's some old photos of me on my pony Blueberry and my horse Chance. It's much easier with four legs under you rather than just two! Jake worked out a new routine for me that I think I am going to like. I wanted to increase the volume in the gym and get each body part twice. The all-over Monday circuit helps accomplish that. If there is anywhere I am falling off, it's the cross-training part. I'm probably getting one good swim and one good elliptical workout in per week, but I'd like more, particularly swimming. And I am getting tennis in 2-3x a week. Last night we had a discussion about whether tennis is really much exercise the way we play it. I figure the big advantage is it keeps me from eating for 90 minutes!! I'd say clinics are moderate exercise, but matches are less so. I have that one week here and there when I am just so much hungrier than usual and it's happening NOW. I'm sure it's hormonal, but I wish there was a way to minimize it. I just ate a bunch of grapes and that helped, but I could go for a bowl of ice cream or pizza or something really decadent. It doesn't help that I weighed in heavier on Sunday (134.6) owing in part, but probably not all, to the pre-race carbo indulgences on Thursday and Friday. I hope I am not hitting a plateau. I'm eating better, and less, than I was at the start of the summer and my activity level is close to the same. Wow, we are barreling toward school, aren't we? We can't let these changes in scheduling derail our goals and undercut our motivation. It just means we have to get more creative and firm up our resolve. I feel that little devil of complacency and failure nipping at my heels too, but there's no way he's going to get his teeth into me...or you. 32 days until the 1/2M. WOW. I just have time for three longer runs scheduled for 7, 9 and 11 miles, short of the 14 I had originally planned on pre-injury. My two other runs each week are limited to 30 minutes, which I find really short, but Jake swears it's fine. I know better now then to second-guess. I'll continue to do some elliptical and swimming to keep up the cardio. In terms of the distance, I'm not really concerned about finishing eventually but it would be nice to have some experience finding my optimum pacing and working out the mental issues of it all. I have my eye on just one more 1/2M this fall - either the Roanoke Half Marathon on November 22 or the SunTrust Richmond one on November 15. 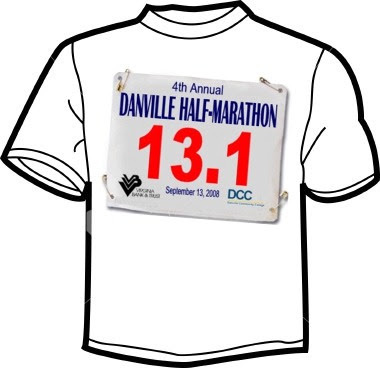 I have a neighbor and friend doing the full marathon in Richmond so that could be kind of fun to join in for the half. JRP suggested some downtime after that to just run for fun. Sounds good for winter! I really enjoyed the race in Salem. It was small and mellow which suited me perfectly. I was glad that our friend Steve was there to run the race too and to help me out as a newbie to this kind of thing. I finished in 53:27 for an 8:37 pace and was really happy with my time. I felt well prepared in terms of strength, endurance, nutrition, and energy. All I was lacking was sleep. It was a good confidence builder going into the 1/2M. Five weeks...let the countdown begin! Steve and I pre-race...looking fresh. Just a quick post to say I am on track for the race Saturday! I had a breakthrough on Monday with six pain-free miles on the Huckleberry trail followed by five pretty good miles today. I can feel things are still tight, but improving. I played tennis Tuesday and Wednesday and am thinking there may be a connection between tennis and tightness, but if I can avoid the pain hopefully it will all work itself out and ultimately be healthier. I'm still treating it with "vitamin-I", ice, massage, stretching. Not sure I am enjoying the carb-depleting of yesterday and today in preparation for tomorrow and Friday's carb-loading. I'm definitely a carb girl!! It was great to play tennis with Sharon again today! It felt good out there and I had so much fun!! It's been exactly three months since I made the choice to get health and fitness back in my life. Able to run almost 10 miles (when injury-free) and can still do 4-5 with little difficulty. Lost 18 lbs and am at 131.8 - 12% reduction in body mass. Can swim a mile (32 laps) of freestyle in 37 minutes. Struggled to do about 4 laps when I began. Gained strength and muscle. Benched 80 lbs and can do two pull-ups. Learned about fitness and nutrition, stretching, running programs, dealing with injury, and the importance of rest and recovery (still working on that one!). I now know that my body doesn't need nearly as much food as I once thought and that if I am eating optimally, energy levels increase. Help my family eat better. Increase lean body mass and build muscle. 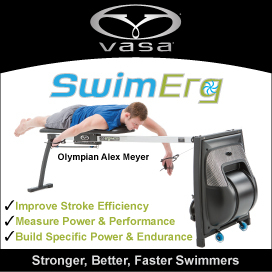 Continue training for additional races. Bench 100 lbs and do 5 wide-grip pull-ups. Improve swimming technique and times (add in strokes). Maintain fitness routine through school year of 2-3x swimming, 3x running, and 3x gym, plus tennis. 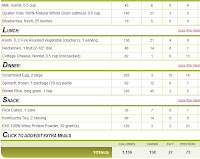 Monitor and adjust nutrition to maintain optimal weight. Steppin' Out is my favorite weekend. Do two Blue Moon beers at Boudreaux's count as "carbo-loading" as in a positive thing????? So I headed out in the dark at 6 am to run at the South Rec Fields. Got there and every light was on and one guy was out on a tractor spraying chemicals (what a waste of electricity...all those lights for one guy). So, I detoured to the VT track and had to squeeze between two locked gates to get in, but I got 4-1/2 miles in with just two episodes of leg spasms that actually dissipated within a few minutes. And I didn't finish in pain!! So, I think I can really do the 10K next week but it's not going to be as easy as it would have been three weeks ago. I'm just going to have to stay relaxed and not stress out and do what I can to finish. I have a tendency to hold back and run with shorter strides when I'm worried about my legs, but by restraining and going slower than my natural rhythm it actually takes more effort, so I just have to let it roll! Steppin' Out this weekend!! Big fun! I need to keep my water bottle and healthy snacks with me to resist the bad stuff!